It’s been a while since my last post as things have been busy for me. Real life versus Instagram life that is. My real life has been filled with making life-changing decisions. For my family, my brand, and business. All exciting things but all ones where the future is unknown, unpredictable, and most definitely scary. But those are the things that challenge us and make life interesting, right? One of those things is an exciting company I’ve been working on and I can’t wait to share it soon! But trust me, it is AMAZING! In Instagram life, I am sure you’ve noticed a few changes as well. For my last photo shoot I decided to have more fun with it, let inhibitions go, and try something different. No grey walls, no street style looks, just an open field and open mind. I’m not sure what sparked the urge to change things up a bit, perhaps it was my own personal life changes that had some influence. Nevertheless, I loved how the photos turned out and how they make me feel when I look back at them. What are your thoughts? I wanted to share one of my favorite looks from the shoot (don’t worry there is more to come). This BB Dakota dress speaks to me with the muted color palette and flowy vibes. This is a perfect summer dress that can be taken into Fall because of the open shoulders with long sleeves. This dress is TTS and perfect for those that are vertically challenged (no need to alter)! While this dress could be styled in so many ways from sneakers to slides, I knew I would be in the fields so I opted for cowboy boots (I did hear that Western trend is coming back) as well as my trusty wool hat. Love this hat brand because they come in different sizes (not just one size fits all) and I have a small head so their hats fit (for those of you with small heads you know what a challenge this is)! In addition to the boots and the hat, I am obsessed with these bold statement earrings and have been wearing them nonstop! The unique shapes are eye-catching and they aren’t heavy at all. I hope you are all having a great summer so far. While lots of things are up in the air for me right now which makes life uncertain, I am still confident in the decisions I am making. Sometimes you just have to trust and know you will end up where you are meant to be. I will try and be a little more consistent with blog posts or life updates, but bear with me because I have other exciting things coming! Loving the wester twist! I’m dying to pic up some western inspired boots, hopefully I can pull them off! I’m loving this look with the boots!! Have a great day babe! This shot is one of my favorites! I always love shots in nature because it embodies that bohemian chic vibe so well! <3 🙂 This dress is stunning! And I know what you mean about the unknown future – it can be quite scary, but the outcome is always better than what we expect! Sending positive vibes your way, babe! These photos are amazing and beautiful and romantic. I love your hair and the beautiful dress!!! I love these pictures, open field and air lead to open mind, Christine! I love city life but sometimes I do love to explore country life like going to ranches here in Texas, just so refreshing. I can’t wait to hear the exciting news you mentioned. Trust yourself and the abilities you have as you are a very smart and confident lady! Awesome pictures, Girl! I really loved the ear rings! Change is good and the best you can do is make as informed a decision as you can. I love the changes in the photos. You look great! YAY to trying new things/ I think your creativity in this open field is so gorgeous. 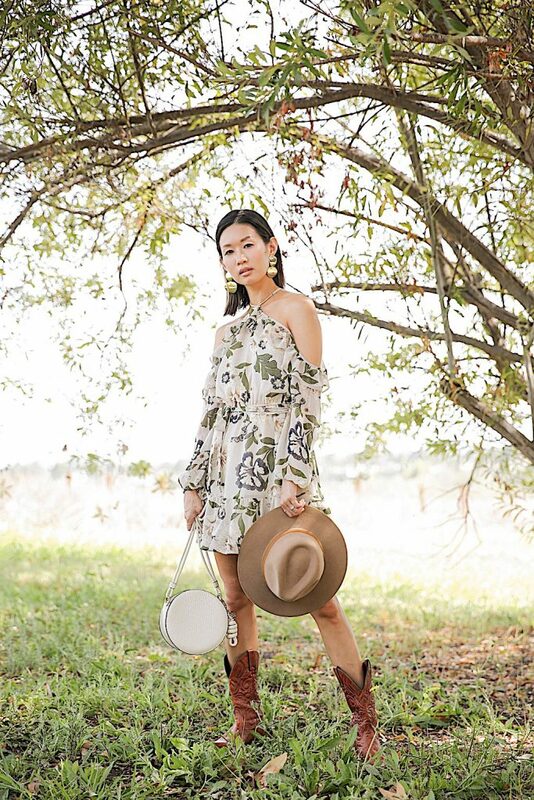 And if I am going to be totally honest…I have never really been a fan of cowboy boots… BUT I absolutely love how you styled the outfit here!! That rufflded dress looks amazing on you dear! You look so stunning! I’m totally obsessed with your dress! Very beautiful and I love you styled it with western boots. You look absolutely gorgeous babe! Love all the ruffles! Love this post, Christine! Appreciate your vulnerability and love that you’re experimenting with your location. Sometimes inspiration comes from unexpected places–but nature is always a great source in our book. The earring is a killer! The whole look is so on point! Super gorgeous dress and the location matches it perfectly! It is good to change things up once in a while. These photos are super fun as is that dress. You look great in it. I am so ob board with the ruffle trend. I bought 2 ruffle dresses and a ruffle tiop. Love your whole outfit! Especially your statement earrings. The scenery is perfect as well. I am in love with this outfit. It has an elegant touch and a different western touch in the bottom. You look gorgeous. I really like this light dress for the summer. This is a gorgeous dress and it just makes perfect team with the boots! love the open space photos. You look dreamy in that beautiful dress. Great styling. Changes are good….and changes can teach us a lot. Sending lots of love, beatiful Christine!